The jewel of South America, the unmatched Torres del Paine National Park in Chilean Patagonia, attracts an ever rising number of backpackers, crowding camp sites and trails, which will lead them around the knife-bladed granite towers, over the golden steppe, along multicolored, fjord-a-like lakes fed by deepblue glaciers. 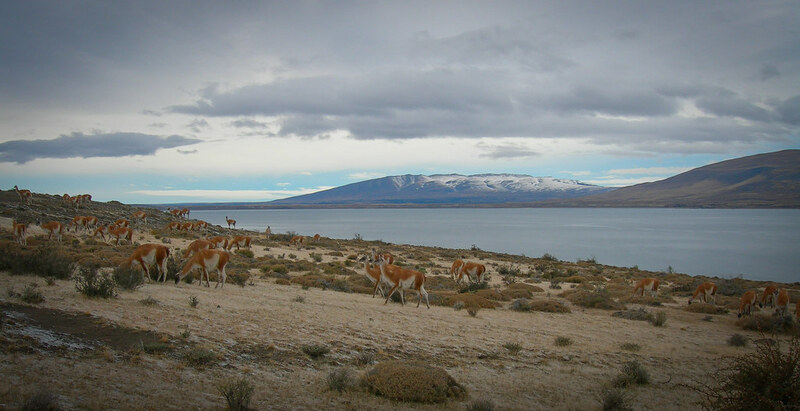 The park has almost all Patagonian fauna at dislpay: guanacos, foxes, condors, endagered huemules and pumas. Torres del Paine summaries every eco-system which you will find in the immense Patagonian landscape. Famous for it’s 4-seasons-in-1-day and fierce winds in spring and summer, people tend to avoid the park completely during the winter months of june, july and august, which is totally unjustified in our opinion! Hikers with winter experience, will be overwhelmed with the silence on the empty trails and vast beauty of the Patagonian nature. We hiked the famous W-trail at the end of july in 2006 and met nobody! We had the park completely for ourselves! This hike changed our hiking hearts from hobby to passion and will always be marked as our complete switch to unsuported “wilderness” (winter) hiking. We came back to the park in autumn 2008 and autumn 2010, but never experienced the same feeling we had back in the Patagonian winter. So what’s about the park in winter (May trough September)? – During the winter , high pressures, coming in from Antartica, stabilize themselves over southern Patagonia providing long spells of clear, cold and windless (yes, you are reading well!) weather. Cold fronts from the pacific will eventually come in, interupting the silence and bringing the sequacious winter dusting! When we were hiking the W at the end of july we had one cloudy day and four days of crisp clear weather, resulting in expansive views over the Patagonian ice field. 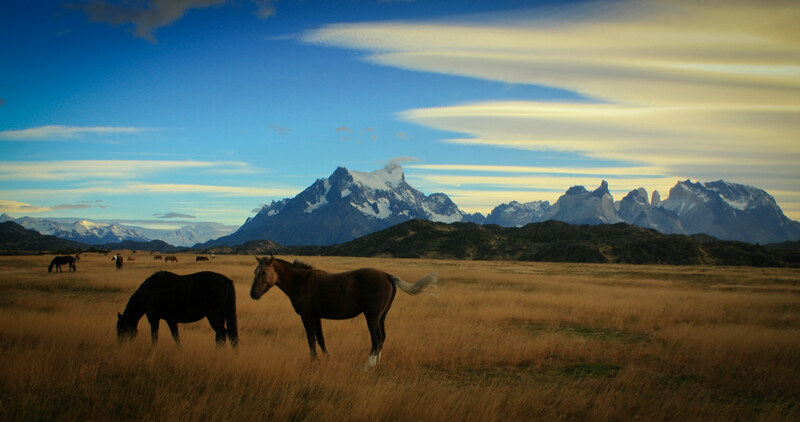 – Torres Del Paine enjoys sort of a microclimate, which provoces slightly warmer than the rest of southern Patagonia. During the day in july 2006, we had temperatures of 12 ° C in the Sun, but of course at night the temperature dropped to around -10 ° C.
– Most part of the the W-circuit is at sea level, so snow accumulation is very low to non-existant. – No tourists, nor the swarming groups of backpackers, crowding the camp sites to extravaganza, for which the park is famous in summer months. – Wildlife descends from the mountains to the valleys. So far more likely to spot wildlife. We have noticed fresh tracks of cougar’s. – No annoying insects. Nor mice or rats stealing your food and biting your shelter to rubbish. What to keep in mind for winter visits to the park? – It’s colder than in summer. Although the difference is minimal. – Rangers will only let you walk the W circuit, because the John Gardner pass along the world classic “Circuito” is blocked by snow and ice (but doable with mountaineering equipment). – Mountain huts are closed, except for the Lodge Paine Grande “(the only non-private operated refugio), but be aware that the building is not heated, so you have to bring a warm sleeping bag. Multiple day hikes can be done from this hut! – Subsequent thaw and freeze cycles, can cause a layer of ice in shady parts of the trails. So this will require more concentration then during other seasons. Light crampons can be helpfull. The upper trail in the Frances Valley and the higher trail to the lookout of the towers will be snow/ice covered. – No ferry boats sailing on the lakes (Grey/Pehoe), so for walking the W-trail you will have to start/end at the administration building. – The bus between Laguna Amarga and Hosteria Las Torres does not operate. – Short days. Late July: sunrise around 8:00 and sunset around 17:30. Full photoset on our flickr page for more pics on this 5-day winter hike into Torres del Paine National Park (2006). 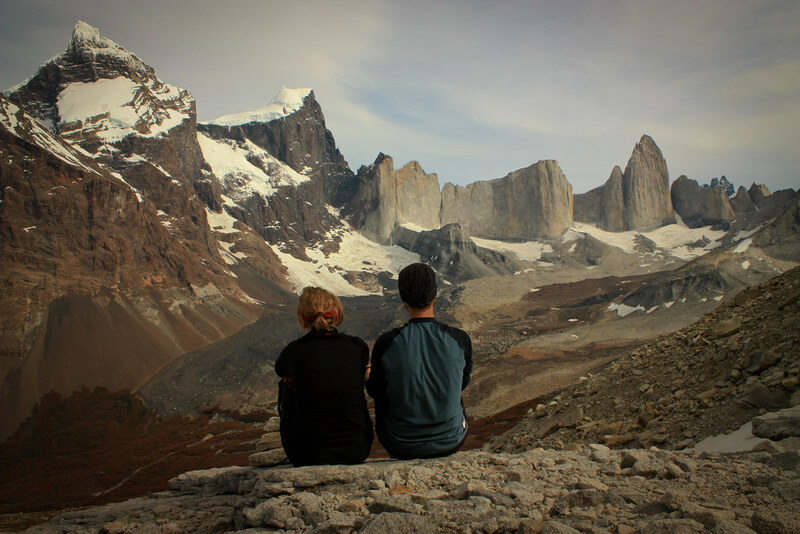 Another photoset on our flickr page from an 9-day autumn hike into Torres del Paine National Park (2010). Pricking the balloon, Chile’s Torres del Paine National Park: A Park in Need => Sustainability of the park, is a big issue for the Chilean government! How to organise a visit to Torres del Paine? This entry was posted in Hiking, Nature, Travel and tagged chile, guanaco, hiking, patagonia, puerto natales, south america, torres del paine, travel. Bookmark the permalink. Amazing photos! Thank you for insight into this part of the world! These are superb photos, Steve, and a reminder that it’s still possible to see Paine at its wildest, at least at the right time, if you’re well-prepared. When I hiked the circuit 30-some years ago, we crossed the Gardner pass in white-out conditions in mid-February; we saw only two other hikers in ten days. thx everybody for the nice comments! 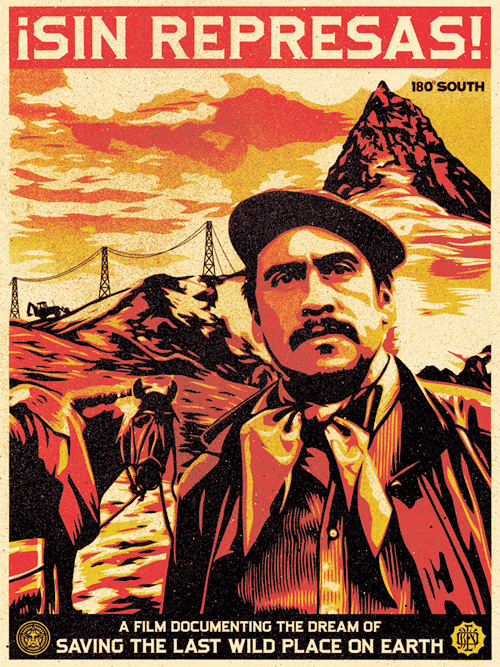 I am planning to go down in June 2012 and was just wondering if you guys hired a tour operator. I’m finding it difficult to find a cheaper tour guide, but we want to make sure we have all the adequate supplies. Any suggestions? Should we go out on our own? We did it all by ourselves. You can do it by yourself, if you have winter backpacking skills. You should be able to be self-supporting in winter camping. Do you have that experience? Are you able to survive if a winter storm sets in? Temps at night can drop to -10*C.
Navigation, on the other hand should not be a problem, the trail is wide and almost never snow-covered I am talking about the W-circuit here! The full circuit in winter is only for those with alpine winter skills.. There will be no huts open, only the one at Paine Grande (altough it was amidst the january 2012 – fires, so please check locally). If any more concerns, just shout. Your pictures and descriptions of the W Trail in winter were very reassuring for me. 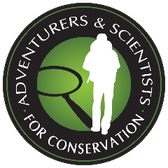 My son and ten other Boy Scouts from North Carolina will be heading to the Torres del Pain this June to hike the W Trail. I was quite uncertain about the conditions they will face during their hike, but your information has made a nervous mom feel much better. 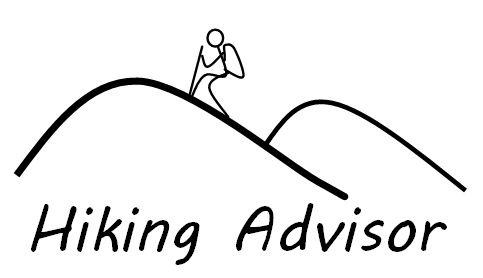 Do you have any advice for their group as far as preparation (they are all packing lots of good, winter hiking gear)? Great advice and photos!! We are planning to circuit TDP in early September. We will have crampons and we will check conditions for the pass before heading off. Thanks for sharing ! Very Nice Photos, I’m gonna go Patagonia in the end of this month. Hope the weather well be great. There are photos of autun in this post and lso a link to an online flickr album of the park in April. Great Pictures! I’m also planning to visit the park during winter. Is it possible for you to give me some details on what course you took during the trip? I heard from verticepatagonia that their services are closed… so I was trying to go through paine grande camping site and grey camping site, or are camping sites still available during winter? 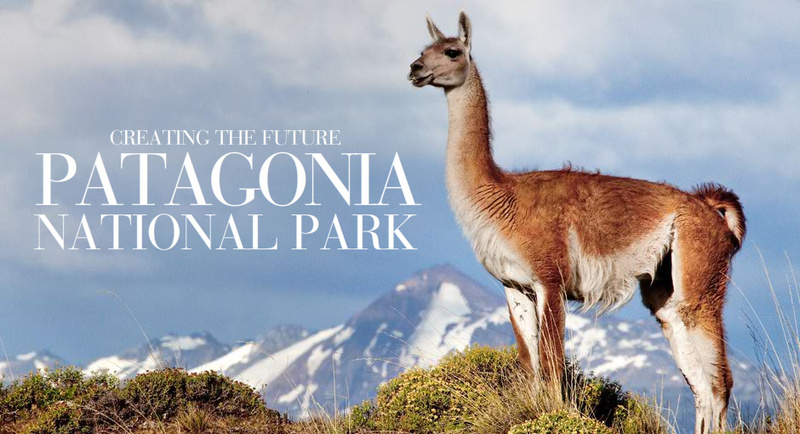 Also, you mentioned that The bus between Laguna Amarga and Hosteria Las Torres does not operate. Does this mean that after visiting las torres camping site I’m unavailable to leave the park there but have to return to the entrance by going back my orginal route? Please, any tips would be greatly appreciated. 1. The danger of winter trekking is that safety margin is way much smaller due to colder temps and wetter, windier weather(risk of hypothermia),… how to prepare for that you can find for example on the backpackinglight FORUM. Also there is way less people on the trails, so less chance of help when somethiing happens. 2. Camps are not officially open. The sites are accesible, but that’s it. No toilets open, no running water from a tap, so it is real bivaouc, in which you have to look for yourself. 3. On severe storms it might be possible that transport can not enter the park for a couple of days or maybe more, but it is not so common, because there is not that much precipitation in winter in the southern hemisphere. 4. You can walk the 8km road from Las Torres camping to guarderia Laguna Amarga. We are trying to visit this coming May and are struggling to find information for winter, specifically transportation. 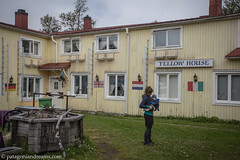 I have found a couple of places in Puerta Natales to stay but do you have to rent a car to get in and out of the park? Thanks for the info! I’m considering doing the W in August and it sounds more realistic than I feared 🙂 It looks like the link to your 2006 photos is dead, is there any way I could get a look at them?